This classic Anne Barge gown is perfect for a traditional bride who dreams of lace and pearls on her wedding day. 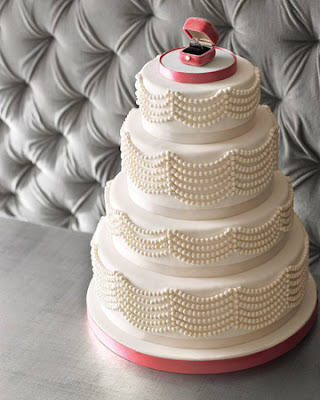 This invitation from Minted sets the tone for an elegant affair, and I adore the cake, adorned with strand after strand of perfectly formed pearls! Oooh that dress is so romantic!! I love pearls too!! Did you know that in South America they believe pearls bring great saddness? I used to wear pearl earrings all the time!! Oooh, very dramatic with the blood red lipstick and the strict hair! Me like! 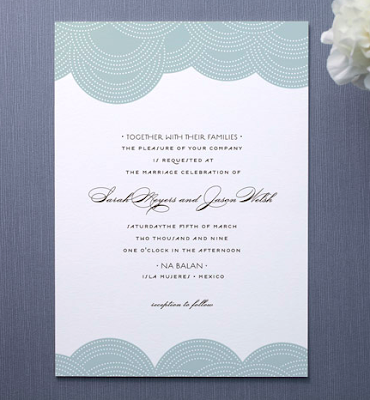 heart, heart, heart that marvelous minted invitation. now i'll be dreaming of glamourous gowns and handsome black tie galas! Oh my I am in love with that dress! the cake is so amazing!! i love the ring on top of it too! This is totally my style! Love pearls and traditional anything! Lady,we're goin'mad about bride dresses!! And yes,we both adore short ones!! Ps this cake's so elegant!! Such wonderful pearls! That dress is just stunning. I love Anne Barge, their dresses feel very Jackie Kennedy timeless. I am so wearing pearls on my wedding day! You're so good at matching cakes and invites! So beautiful! LOVE the cake, LOVE the invites, LOVE the dress, holy cow you have good taste! Even Isaiah was all - "That's dope," which basically means "OH MY GOD! THAT'S FLIPPING FANTASTIC AND DELIGHTFUL!" haha...or something like that. Lizzie, I got a "That's dope," from a dude? you have an amazing simple blog! i love that wedding cake and all the pictures are already giving me ideas for my big day. Lovely- the detail on the cake is mastery. oh mah goodness. that gown is absolutely gorgeous. and i'm trying not to look at the cake (diet), but it is just perfect. that is artistry at its finest! oh the ring on top! its like a showgirl on a stage. The cake with the pearls is so beautiful! wowww! You've been showing the most lovely cakes lately. This one is by far my favorite!